"Epic landscapes beneath the microscope have inspired me to produce multimedia landscapes that provoke profound questions regarding our relationship to scale and scientific discovery. " 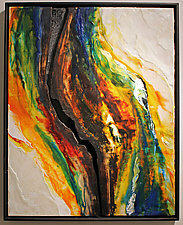 Carol Flaitz uses abstraction to develop textured paintings that are inspired by scientific electron microscope imagery. In a world only one millionth of a meter tall, she finds geological landscapes that have inspired her to develop a new visual frontier. Using aspects of these images as a starting point, Flaitz develops profound textural images of a questionable scale. 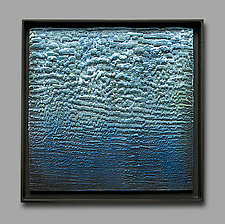 Flaitz uses a myriad of media including acrylics, crystalline salts, ground glass, damar and polymer resins, encaustics, and burnt wood, resulting in paintings so rich in texture that touching them becomes a sensuous experience. Each painting is created on maple- and birch-veneer plywood and finished with handmade poplar frames individually built for each piece. Carol Flaitz's artistic career began at the age of thirteen under the instruction of Katherine Nelson, a student of painter Hans Hoffman. Flaitz received her BFA from the Alfred University College of Ceramics in her hometown of Alfred, NY, and then went on to receive her MA in ceramic sculpture at the University of Wales in Cardiff, Wales.